A handout photo taken by Greenpeace on September 18, 2013, shows an officer of the Russian Coast Guard pointing a gun at a Greenpeace International activist during environmentalists’ attempt to climb an Arctic oil platform in the Pechora Sea. 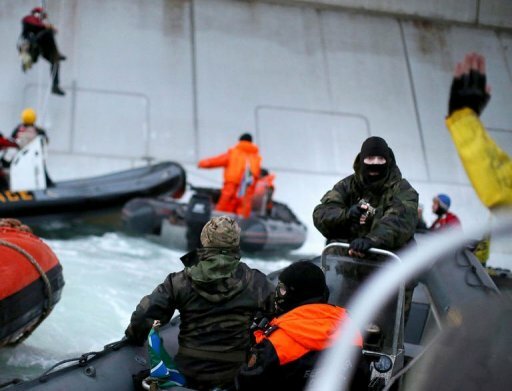 MOSCOW (AFP) – (AFP) – Environmental group Greenpeace said Thursday that armed Russian officers had stormed its ship protesting oil exploration in the Arctic and detained all its crew in a locked room. Activist Faiza Oulahsen called AFP from Greenpeace’s Arctic Sunrise icebreaker and said the crew had been locked in the ship’s mess. “Twenty-nine of us are being held in the same room,” said Oulahsen, 26, who said that between 10 and 12 officers apparently from Russian security services had boarded the ship. “No one has been hurt, and spirits are high. The crew is however not in control of the ship at this point,” Greenpeace wrote on Twitter. Two other Greenpeace activists detained earlier by Russian coastguards were also locked in the ship’s mess, said Oulahsen, before she abruptly hung up, saying she could not talk any longer. The two men, from Finland and Switzerland, were detained when they tried to scale an oil platform owned by Russian energy giant Gazprom in the Barents Sea on Wednesday and held overnight. Greenpeace said earlier that men armed with machine guns had boarded the ship by lowering themselves on ropes from a helicopter. The environmental activism group said it believed its Dutch-flagged ship was in international waters when the raid began. It said on Twitter that it lost contact with the ship for around an hour before activists on board managed to get in touch by telephone to say they were locked in. Russia’s foreign ministry earlier Thursday said it had summoned the Dutch ambassador to Moscow Ron van Dartel to issue a protest over the activists’ “aggressive and provocative” behaviour. It said the campaigners who had tried to climb up Gazprom’s Prirazlomnaya oil rig had carried out “extremist activity”. Their actions “threatened people’s lives and could lead to environmental catastrophe in the Arctic”, the ministry said. Vladimir Chuprov of Greenpeace’s Russian office dismissed the foreign ministry claims, saying the ship had not violated any laws. Greenpeace said that men on the coastguard boats wore balaclavas, fired over 20 shots, and slashed the activists’ inflatable boats with knives. Russian coastguards are part of the FSB security service, the successor to the KGB. The group said its activists would hold a protest Friday morning outside Gazprom’s Moscow offices. Greenpeace says Gazprom — the world’s largest gas company — risks causing a catastrophic oil spill in an area with three nature reserves that are home to polar bears, walruses and rare seabirds. Gazprom is due to start production from the Prirazlomnaya platform in 2014. Greenpeace argues that the oil platform is “an Arctic disaster waiting to happen”. Director Kumi Naidoo, who led a similar action against the oil rig last year, asked President Vladimir Putin to “restrain the coast guard”, saying the campaign group “has done nothing to warrant this level of aggression”. Gazprom has expanded its oil production operations in recent years and describes the oil field that the Prirazlomnaya will tap into as an essential element of its oil business development strategy.